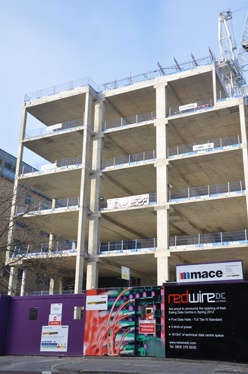 London, ** November 2011 – Redwire, the developers of a new state of the art carrier neutral Data Centre in Ealing, west London have completed the construction of the frame with the first 600 kw of dedicated customer space going live in June 2012. The Data Centre, which is located in close proximity to Ealing Broadway with excellent links to central London, is being developed by Redwire recognising the ever increasing demand for data processing and storage. The facility offers 17,500 sq ft of technical space arranged in five dedicated customer halls each delivering 600 kw of dedicated capacity and at a minimum power density of 1.75kw per sq m and is being delivered throughout the facility.